This is based on a “list” by Long Beach City College adviser Pat McKean, which he gives to his students attending the conventions. Thanks Pat for sharing! Please take care of packing and the bank before you meet at the rendezvous point for your trip to the convention. Check with your adviser about leaving your car for the weekend. Remember, during the weekend, the campus will be rather deserted and the police may be ticketing your car (unless you have made prior arrangements with them) so please arrange to get dropped off, if possible. Also, thieves prey on unattended cars parked for long periods of times in deserted locations. PLEASE DON’T GET A PARKING TICKET!!! Your trip may involve Hovercraft, autonomous cars, tired burros, rattly trains, late planes, dinghys, space ships, rickshaws, camels, feet, skateboards and bikes. Your registration fee includes breakfast on Friday and Saturday and the awards banquet dinner on Saturday evening. You will be on your own for lunches and dinner on Friday evening, so bring money. If your college provides this, check with your adviser in case you must save your receipts for all you spend and/or if you are given cash and must return anything unspent to your adviser(s). Please read and sign the form and the media release form BEFORE registering. Pay attention to the rules – do not cost your classmates, college or teachers any loss of respect. You getting your own ride home is not a good way to end your journalism experience at your college. All of your college’s awards earned at the conference will be taken away if any members of your group break the rules! They are the most important and practical part of the convention. The many workshops will be led by expert speakers from websites, newspapers, magazines, other media companies, universities, Community Colleges and other government and private organizations. JACC has tried to make the program as diverse as possible with workshop topics including careers, social media, writing, photojournalism, page design, technology, interviewing, broadcast, opinion writing, new media, copy editing, investigative reporting, blogs, music reporting, teleprompters, infographics and many other topics. Tours of interesting sites in the area also are planned. Vendors will be set up to inform you about goods and services. Please plan to attend as many workshops as possible and take some notes that you will share with your classmates; bring any handouts from the workshops when you return. Several times during the weekend, you will have a chance to have electronic or hard-copy page layouts, photos, artwork, stories, resumes or your past work or on-the-spot entries reviewed individually or in a group. Please take advantage and watch the schedule for those important sessions. Bring a few of your college’s publications each. Bring extra issues of your newspapers and magazines to share with other colleges and their students. Please pick up their publications as well. The convention is a fast-moving event. Please plan to have comfortable walking shoes, a sweatshirt handy, a backpack to carry your gear and patience to deal with a busy environment. The weather at the conference could be a little cool, a little drizzly, a little warm, or a little windy, so be prepared. Weather apps with a Zip code of 91505 are helpful. Saturday’s awards banquet is a time when some students get dressed up, but don’t spend any extra money. You will see some in fancy clothes and others in T-shirts, baseball hats and flip-flops. The conference schedule to be given to you already is the best we have. Check jacconline.org, Facebook, Twitter or blogs for updates. Changes happen, workshop and competition room numbers and sites could be changed and other information will be provided. A detailed and perhaps slightly modified schedule will be posted soon and a hard copy handed out when we arrive at the conference. There is also a mobile app with a schedule/calendar; look for the information in the printed schedule once you arrive. Participating is the best education you will gain. Enjoy the experience, don’t sweat winning or losing, but turn in an entry each time! The conference includes competition in social media, video story, writing, photojournalism, copyediting, cartoon and news judgment and layout. You will put a code number on your entries, which later is matched with your name. Follow all the instructions given at each contest. Two people from each college may enter each contest. JACC will have a limited number of computers for photogs. IMPORTANT: All writing will be done on your laptop or ones your group is bringing. PLEASE DO BRING and use a thumb drive, dictionary and A.P. Stylebook, pens and notebooks, all photo supplies and chargers for phone, laptop and other devices. The meals are a good time to get to know each other and about 500 students and teachers from about 50 other colleges. The two awards sessions are where our best work, and that of other winners, is recognized for state honors. IMPORTANT: ONE student representing each college MUST attend the General Assembly as well as the Student Meeting and Elections. Check the schedule for day/time/place. GOOD LUCK, LEARN AND HAVE FUN! 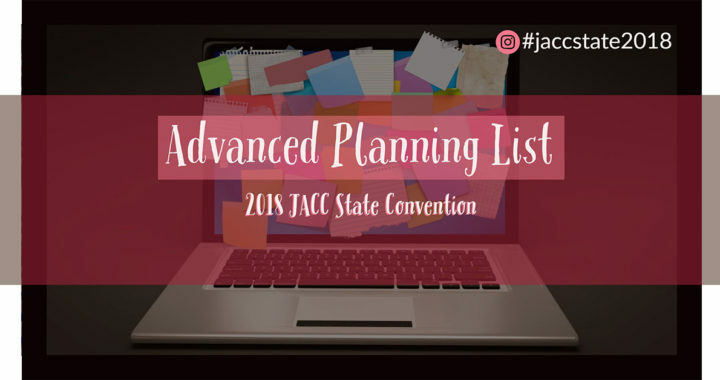 Posted in 2018 Convention, Blog, State Convention and tagged list, Pat McKean, what to bring.